His Holiness Indradyumna Swami had been traveling every year for a couple of months in the U.S in the service of Srila Prabhupada since 2001, inspiring the devotees in various temples and kirtan communities all over the U.S. However, in 2010, he could hardly do half the cities in the schedule due to his health failing to keep up with his enthusiasm. As a result, the disciples of Indradyumna Swami came up with an idea for his 2011 tour: Instead of Indradyumna Swami traveling to each city, how about the disciples and well-wishers travel to a central location where they could have his association ? This way, everyone could still benefit from his association and the association of each other without straining Indradyumna Swami’s health. That central location was Dallas. Since Indradyumna Swami loves the association of his godbrothers, he invited Giriraja Swami and Chaturatma Das. Since Indradyumna Swami loves kirtans, he invited Badahari Das and Purusartha Das. There were about a hundred disciples that visited Dallas for a weekend of kirtans and classes. To our amazement, the local devotees in Dallas also participated enthusiastically in all the programs and provided all the logistics support including prasadam, accommodation, transportation, etc. It is then it occurred to us: Why not make it a public event next year where many devotees and many spiritual masters can come together for a weekend of kirtans and classes ? Indradyumna Swami instructed us to look for a retreat center near Dallas since that would enable us to do an all-day kirtan program (instead of being able to have programs only in morning and evening). Ramvijaya Das from Austin found a beautiful retreat center at Wimberly, Texas which is about 45-minutes from Austin airport. We asked Indradyumna Swami what to call the event as. Indradyumna Swami thought for some time and said: “Let’s call it the Sadhu Sanga Retreat”. 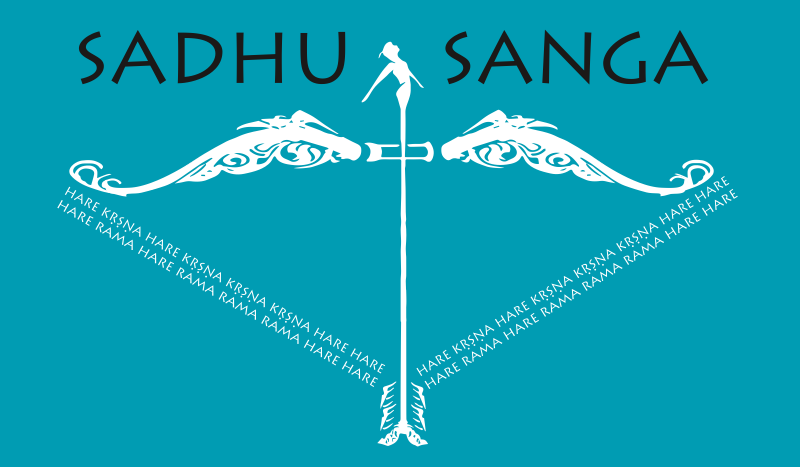 And so the first Sadhu Sanga Retreat began in 2012 with an attendance of about 400 devotees from different parts of the U.S with the majority from Texas. Indradyumna Swami also invited his favorite kirtaneers such as Madhava, BB Govinda Swami, Ananta Govinda das, Acyuta Gopi dasi. Radhanath Swami was scheduled to attend but had to cancel out in the last minute due to a plane crash in Nepal in which a few devotees from Chowpatty passed away. Dallas Kalachandji’s restaurant’s head chefs Swetha dasi and Daruka Das and a professor from Utah named Ramesh (now Rasavilas Das) took care of preparing all the 9 meals for the event with the help of many many devotees. Overall, everyone was satisfied and could easily understand that the source of the satisfaction must be because Krsna must have been pleased with the intense Sankirtan yajna and mood of cooperation and service rendered by the Vaishnavas to one another. The word spread quickly and next year, in 2013, over 700 devotees attended. That year, we were fortunate to have the presence of His Holiness Sacinandana Swami taking charge as the main MC for the event guiding devotees to enter a deeper mood of meditative and prayerful kirtans with his constant reminder to take shelter of Krsna’s holy names. Mukunda Datta Das also started attending the retreat and brought his unique classical flavor to the already diverse array of kirtaneers. The quality and quantity of prasadam was also increased by the expertise of Swetha and Daruka and the numerous volunteers. Again, everyone felt so satisfied and it became a self-evident truth that Krsna must have been pleased. Otherwise what is the explanation for the intense satisfaction and bliss we were experiencing ? For 2014, it became clear that we had maxed out the capacity of the hall and kitchen at the Wimberly location, so we were looking for a larger facility. By Krsna’s arrangement, Ramvijaya Das got an office assignment that took him to North Carolina and he spotted the Art of Living’s Heavenly Mountains retreat center. With a kirtan hall capacity of 3000, a dining hall capacity of 1000, onsite accommodation for 1000 people in the picturesque Blue Ridge Mountain area, with the venue being central to many devotees on the East Coast, it didn’t take long for us to decide that’s the right location. We were also blessed with the association of Radhanath Swami and Gauravani for the first time that year. Lord Caitanya reciprocated so kindly by inspiring over 1400 devotees to attend the event and made the overall experience so relishable for all. The amount of selfless service spontaneously rendered by devotees to facilitate one another’s experience at the retreat was the obvious highlight of the festival for all that attended. In 2015, we continued at the same venue with an attendance of 1600 devotees. In addition to the regular kirtaneers, we were blessed with the association of Niranjana Swami, Vaisesika Das and Sri Prahlada Das which took the festival several notches up, inspiring everyone with their sweet bhajans. Selfless service continued to be the highlight of the festival as evidenced from the feedback from the devotees that attended the retreat. 2016 was a special year in which we celebrated the 50th anniversary of the incorporation of the International Society for Krishna Consciousness in a grand manner with over 1800 devotees in attendance. We were blessed with the association of over 75 disciples of Srila Prabhupada whom we honored with free registration as a token of gratitude for their selfless service in spreading the holy names and transcendental knowledge of Krishna throughout the world. In addition to most of the regular kirtaneers, Agnideva Das and Nadia Mani Devi Dasi joined us, adding more to the transcendental variety of kirtans. An elderly first timer who has not had much of the association of devotees felt that the retreat was “one of the most powerful, beautiful, transcendent, transformative and extraordinary experiences of my entire life.” Those words summarize the overwhelming experience most people felt at the retreat. We are intensely praying to Lord Caitanya to kindly engage us in His sankirtan-yajna by allowing to serve each and every devotee that attends the retreat in 2017 and beyond. “In this Age of Kali, people who are endowed with sufﬁcient intelligence will worship the Lord, who is accompanied by His associates, by performance of saṅkīrtana-yajña.” (Srimad Bhagavatam 11.5.32).